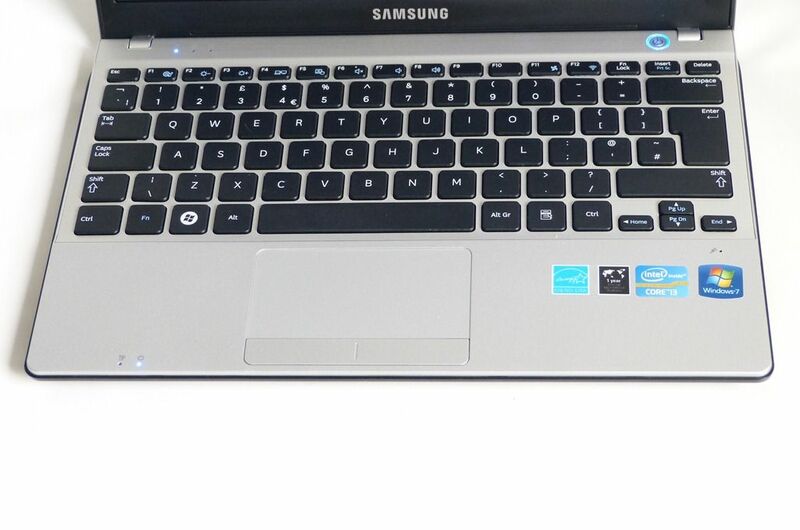 Before we get into the detail on the Samsung NP350 I need to make it clear that I bought the Core i3 (2.2Ghz) version in the UK for a pre-tax price of about £370 (pre-tax business purchase price that equates to under $600 in the USA) In the UK, Ultrabooks start at around £680. The price differential isn’t so pronounced in other countries. E.g. 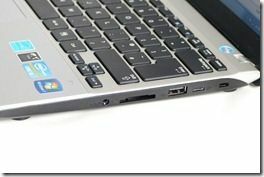 In the USA, the Core i5 version of the NP350 is around $700 (where Ultrabooks start at $800) Having said that, the NP350 offers features that match, and in some cases beat Ultrabooks. I’ve bought the NP350 for use over the next months while i wait for the next wave of Ultrabooks and will be using it for blogging, video production, image editing, storage and as my day-to-day desktop. 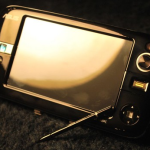 Update: The original article had a battery capacity calculation error. Please see the correct figures in the battery testing section below. Note: In the UK, the Amazon price is up by £100 now. Keep an eye out for offers. Full specifications and information links in the database. For those that like to kick back with a video, check out my unboxing and overview video embedded below. Correction: We made a mistake on the battery capacity. It’s 47Wh, not 60Wh. Battery life figures have been updated below. Plastic materials and styling nothing to write home about. Functional and good for a plastic casing though. Silent operation in office mode. Quiet fan. If I have to complain about something It would probably be the screen although I’ve seen worse and can’t really call it bad. There are better keyboards out there. 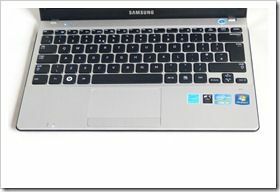 The Samsung Series 9 keyboard, for example, is better than the keyboard on the NP350 but I don’t rate this as a bad keyboard by a long shot. It beats the UX21, UX31 and Acer S3 and for many it will have a better feel that the Z830 keyboard. There’s enough travel and the keys aren’t wobbly or mushy. If the NP350 keyboard had a backlight it would be a complete winner but unfortunately it hasn’t. The screen is the one item on the NP30 that I would call cheap. It certainly doesn’t win any brightness or viewing angle awards. It’s got a matt finish though and at the correct viewing angle the blacks are black and the colours are OK. I don’t see how anyone could moan about the screen although there’s always room for improvement. The screen doesn’t lean back further than 45 degrees. I’ve been through a number of tests with the NP350 and apart from the hard drive which affects some test results the CPU and GPU performance is right up there with the Ultrabook average and beats the Core i3 Ultrabooks by quite some margin. The Elantech touchpad isn’t giving any problems either. In over a week I haven’t experienced any pointer jumping or other issues with either the mouse or the keyboard. 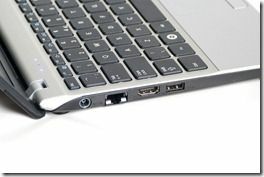 The result beats the Acer Aspire S3 but falls behind the SSD-based devices. 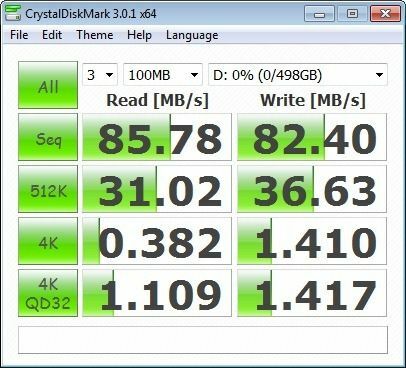 Disk speeds are better than the Acer Aspire S3 but nothing compared to SSD-based results from Ultrabooks. 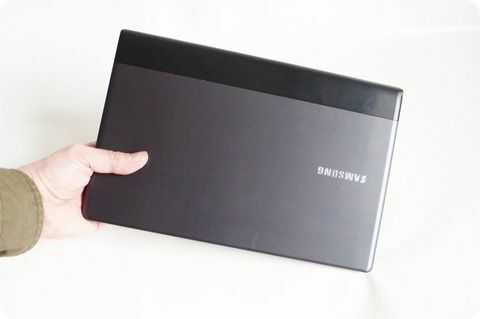 The Samsung NP350 would benefit from an SSD retro-fit. You probably won’t be booting the NP350 from cold much because standby works so well. it won’t stay in standby for as long as some Ultrabooks but in one week of use I haven’t rebooted the NP350 a single time. Return from hibernate is not as fast as on Ultrabooks. Cold Boot – 50 seconds until login prompt. 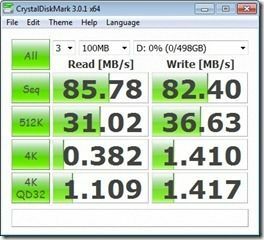 Disk stays busy for a minute or two after login as is the case with all hard-disk based Windows systems. Starting up Cyberlink PowerDirector, a large video editing suite, takes many times longer on the NP350 than it does on an SSD-based device. 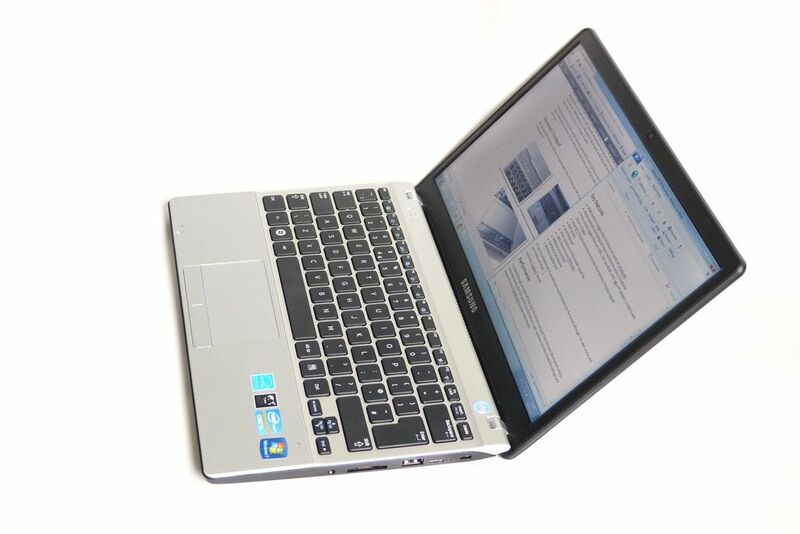 Hard disk speed is the main difference between the performance of the NP350 and average Ultrabook performance. 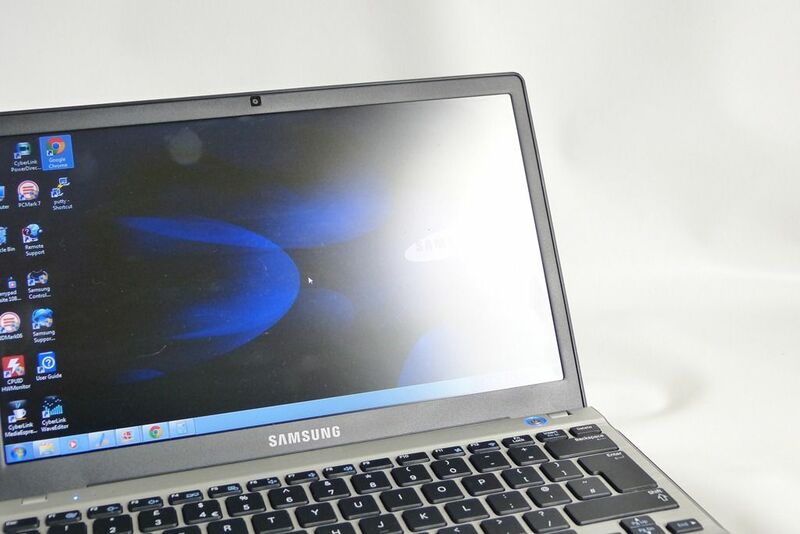 The Samsung NP350 has a battery drain range between 4 and 45W. It’s a huge range but it’s nice to know that office work remains down in the 10W area with Chrome-based browsing tests resulting in an average 7.5W drain on a clean system. Video Conversion using Cyberlink Media Espresso (and Intel video conversion hardware) 17W-36W = Under 2 hours in high-performance mode. Wi-Fi reception quality and throughput is better than average. 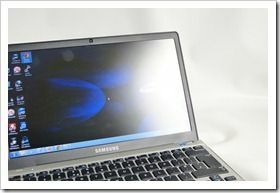 The Samsung NP350 is a true, lower-cost alternative to an Ultrabook that offers the same CPU, GPU, battery life and weight figures. 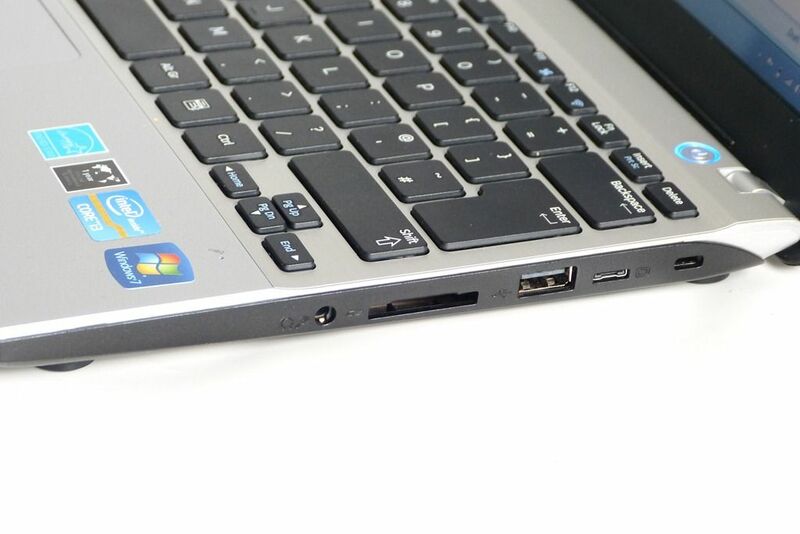 The hard disk comes with plently of storage space but doesn’t match the performance of the SSD-only Ultrabooks. While there are cheaper Core i3 devices, it’s difficult to find one that is so mobile, has the 2.2Ghz clock and, at least in the UK when I bought it, a great price. You can also check it yourself by opening your notebook – its easy – only 8 screws including 2 under rubber feet. Battery life figures that you posted are therefore wrong. It looks like you only measured power drainage for a moment and calculated it using that wrong 60Wh figure. Real test were performed and battery life in wlan web surfing was 4h 58m not 8h as you post. This is serious allegations. Anyway, according to my specs, it says 67W. 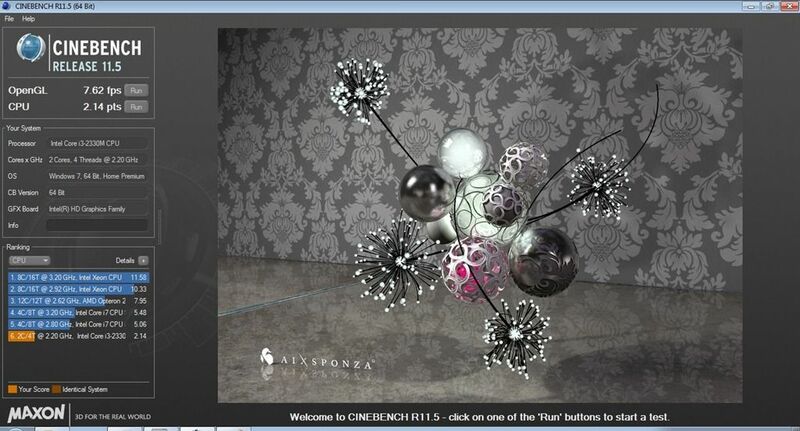 I tend to believe it cause I do get about 6 hours on a thirsty core i3. Maybe different markets have different capacity batteries. Don’t you think Chippy has probably also manually observed the battery life during different usage scenario’s & not just sat down doing estimate calculations? There could be numerous reasons why your picture says what it says (different region model, incorrect printing, etc). We’re talking here about two different computers ! 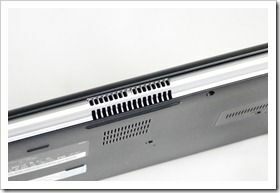 The device on the photo from the polish notebookcheck forum is 350U2A. So unless Chippy can take apart 350U2B, we can’t say it’s 47Wh battery there. NP350U2B was tested by hungarian portal Prohardver and also 47Wh battery was reported. In my opinion it’s unlikely that other market/version of NP350 would have higher capacity battery. That 47Wh battery is already the biggest you can fit in there and it’s already made in Li-Poly technology so no room for improvement here also. I have indeed made a mistake on battery capacity despite doing some multi-hour drain tests. I’m immediately going to put some notes in the review and re-visit the test figures. Again, my apologies. This is the first time in 5 years of battery life testing that i’ve slipped up like this. It’s good that you reacted so fast because I think that battery capacity is very important factor when choosing mobile computer, especially in this form factor. I have corrected the extrapolated battery life figures. The drain figures remain correct and i’m happy to say that my figures are now close to the test figure quoted by TwojStary above. I calculate 6hrs in basic web use and just under 5hrs in heavier office-like use. So, is it really 47W or 60W? Is Samsung then misleading the public? However, its illegal to konowingly keep misleading info in marketing materials so we are going to contact local authorities about this, in case Samsung denies to corect that info. I bought my NP350 soley because the website said it was a 66.67 Wh battery. If it is not, then, this is shocking and upsetting. different regions, different models, many times they have different capacities. 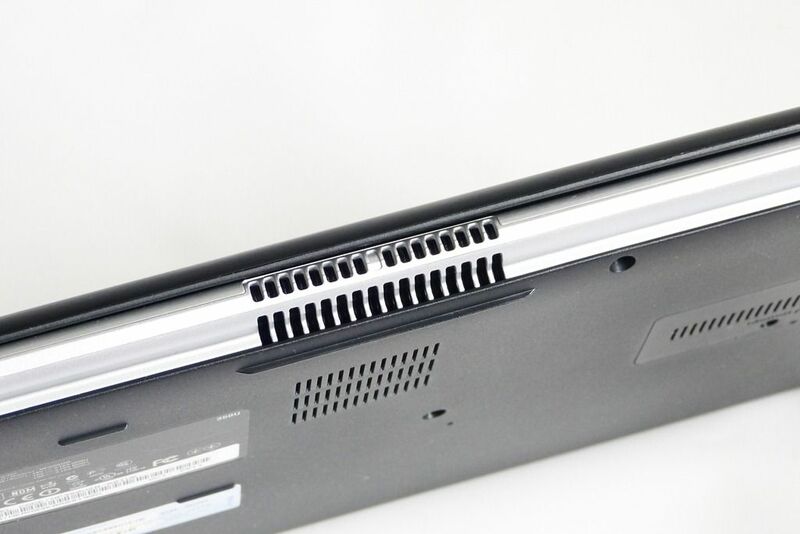 This used to happen with netbooks ALL the time. Thanks for the excellent review, you balance detail and brevity well. You mention your intention to upgrade the HDD to solid state later on: is this supported by the warranty? ie. I want to upgrade in the future also, but also want to buy a 3 year warranty. I’m getting an SSD in for the upgrade, yes, but it will invalidate the warranty. Now that you had a road trip with the NP350, how about a follow-up with your real-world experiences with the device? This NP350 isn’t being used any more so i’m selling it. It’s a UK keyboard and i can only ship to EU. If anyone’s interested, give me a shout. As far as I can see it’s been totally removed from the market in UK now which is very suspicious. The NP350 was too good for the price IMO! Thanks for this. This actually comes in an i5 2430 and a 1TB 5200rpm drive here in the Philippines. Strange though that this wasn’t such a mainstream success despite the level of compactness Samsung put within this ultraportable.